The Elementals are the Devas\Spirits of the elements (fire; earth; air; water; ethers) that make up all lifeforms on this planet. For ages, people who have lived close to the Earth have known this and lived accordingly. In these current times, most people do not live within the natural rhythms of the Earth Mother and they feel disconnected. You can change that today. Bring your willingness to ''Aligning with the Elementals'' and accept the invitation from ALL of life to join WITH it, to celebrate it, and take this journey now into expanded possibilities. 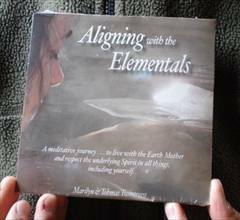 This CD offers a guided meditation to ''Aligning with the Elementals'' along with musical background, followed by an instrumental segment that provides support for integrating the meditation.